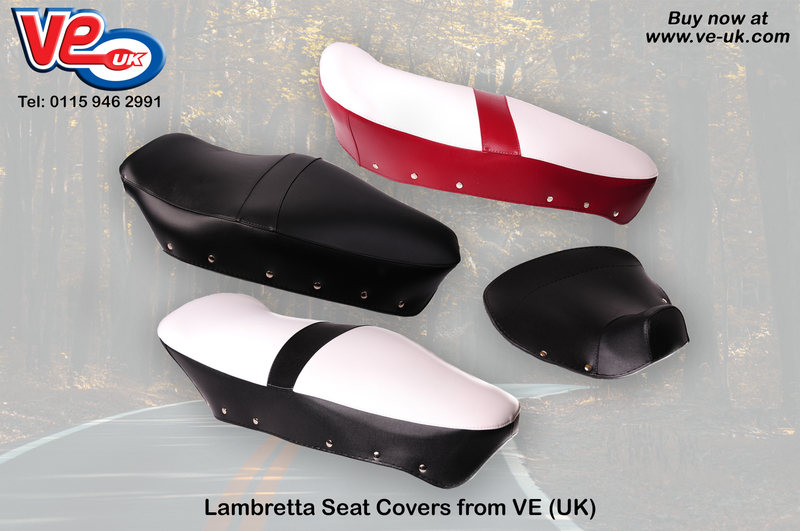 VE (UK) has some great products for Lambretta owners looking to refresh that tired looking seat on their scooter. Our range of replacement seat covers are available for many models of the Classic brand. The range includes both single and dual seat variants dependant on model. Dual seat fittings include SX, GP, and TV models, while the single seat covers are available for the LI and LD models. Of particular note for Lambretta SX owners are the dual seat covers which are available in white with a red stripe, and white with a black stripe allowing further customisation of their machine. All our replacement seat covers are manufactured from high quality materials, and are supplied complete with the required fittings, are pre-shaped, and ready to fit. This entry was posted in Lambretta parts. Bookmark this page.